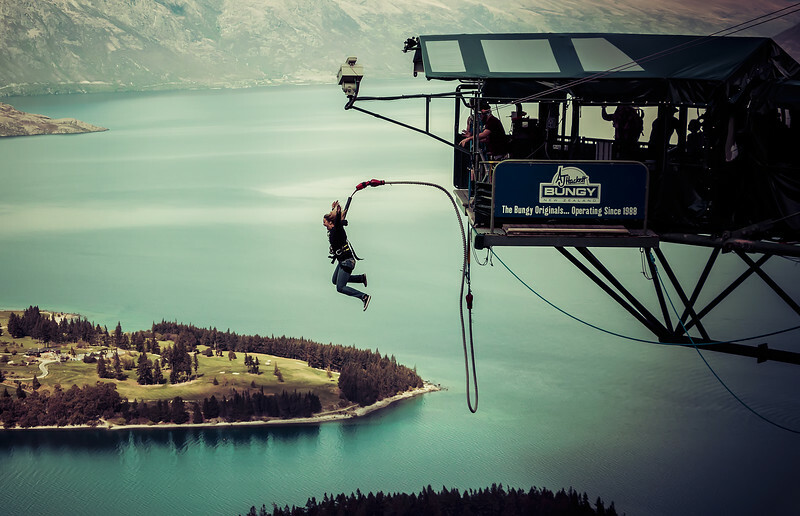 Bungy jumping is so much fun, I've done it twice. Once in Skippers Canyon and once off the Kawarau Bridge. When I jumped off the Kawarau bridge I went backwards which involved leaning back and being suspended there until they they let you go. It was actually rather comfortable until they said "bye" and let me go. I knew it was coming yet it was still a surprise! This photo was taken from the Skyline Bungy or Ledge Bungy located in Queenstown at the top of the Gondola at Bob's Peak. Queenstown, the perfect place to fling yourself off perfectly good platforms. It sounds slightly crazy, but then AJ Hackett does crazy very well.